We could listen in as demonic forces plotted to undermine the faith of a man of God? The Christian son in an Islamic family feared for his nine-year-old sister as her wedding day approached? An abortion provider offered pro-life counseling with the devious intent of killing more babies? These short stories and many more comprise this volume that looks at our culture from a perspective different than what most of society considers politically correct. The Zapped! 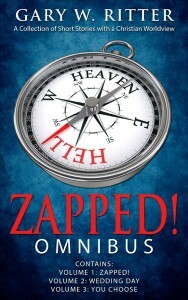 Omnibus is comprised of three separate e-book volumes: Zapped!, Wedding Day, and You Choose. Each story was written to a specific topic in a writing challenge with a total length about that of a normal typewritten page. It makes for very quick reads for each story—no more than three minutes apiece. Dip into something different. Think. Learn. Grow. Be entertained. His wife, Nancy, examined the marquee. “This is fabulous.” She grabbed the hands of their two children, Danny age ten, and Angie age nine, to hustle them up the steps of the imposing redbrick building on K Street. The family, fresh in the nation’s capital on vacation had scraped, scrimped, and saved for over five years to make this journey. The parents figured that only in Washington, D.C. could they teach their children the value of big government and how it benefited equally all peoples under its control. Mark and Nancy had had many discussions as to how free markets had distorted the values they believed sacrosanct. Only by the even hand of government could everyone get a fair shake. To have overlooked the presence of this museum as they planned their trip was almost unimaginable.